These are some of the best cookies that I've made. I took a chocolate chip cookie dough that I've perfected, and just made it with other mix ins. 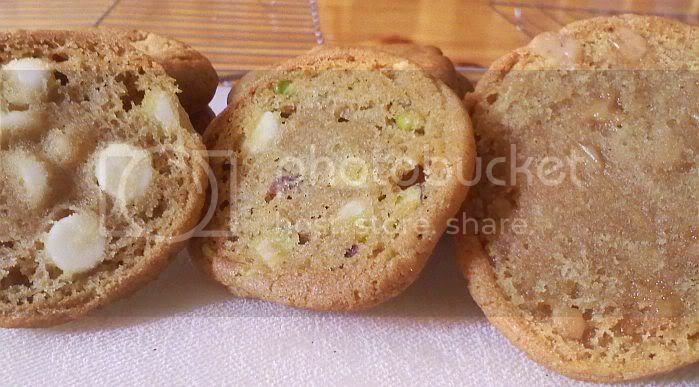 It was originally supposed to be only white chocolate and pistachio cookies, but I had toffee pieces, too, and my sister is allergic to nuts, so I made some with just white chocolate chips. These cookies were eaten up in 4 days, and there were about 4 dozen. They're crisp around the edges, and soft in the middle. They're not puffy cookies, they're almost like store bought cookies, but with the homemade feel. Love em! So, I had some pie crust in the fridge from when I made the strawberry pie, and it's still good, so why waste it? I had apples, too, so I resolved to make tiny apple pies with 6 oz ramekins. I used a crisp topping because I didn't have enough pie crust dough to go on the top. These pies/crisps are really great! They serve two people per tiny pie, or just one if you're hungry and in the mood for an American classic. These cookies are really great. 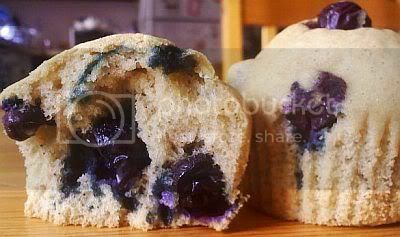 I just made them today to use up some extra blueberries before they go bad. 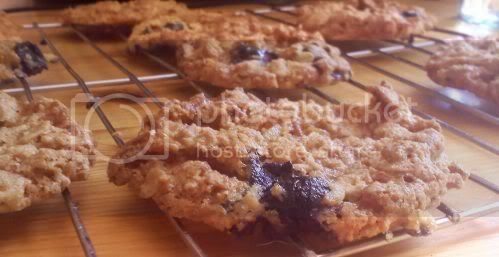 They're like granola blueberry cookies, but really really tasty. I only made a half batch because not everyone in my house likes blueberries, and it has coconut in it, which is another not so popular item. 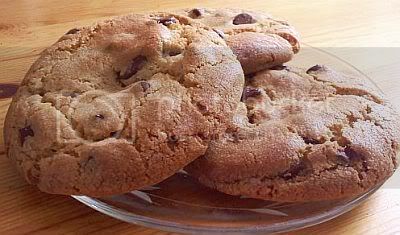 The coconut was toasted, and adds great texture to the cookie. It's sweet, and crisp, and they're almost gone now.. This is definitely going to be a popular cookie in my house, despite what I originally thought. So, I haven't been lazy with my baking, I've only been lazy with my blogging. I'll list the things I've baked: Chocolate chip cookie dough cheesecake, doughnuts, peach cupcakes, and apple/pear crisp. My favorite food on this list has to be the peach cupcakes. I really messed up on the icing, but overall the cake was really good. I used the fluffy cake recipe that I used for the Kahlua cupcakes, but I changed the ingredients a little. I added cinnamon, diced fresh peaches, and peach schnapps. 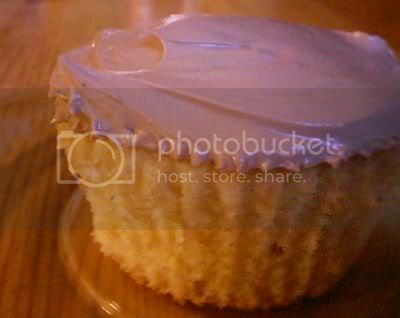 The cupcake tasted really fresh and summery. To me, peach is the ultimate summer fruit. It's sweet, orange, and juicy, and goes well with almost everything. It's so versatile and I love it! The doughnuts were a struggle. I haven't done any yeast baking, so this was kind of a trial and error type deal. I made the dough in the breadmaker and then rolled it out and cut it out and let it rise in the oven because it's draft free. I should have let it rise under a damp, warm towel because that would have added moisture and still have covered them. As soon as I turned the oven on to see if heat would help them rise, they did rise some, but I think I lost a lot of the rising time. They still turned out kind of nice, but I'll definitely try another recipe or something next time. Maybe one with bread flour next time. The cheesecake was made for my boo, because he really likes cheesecake and whatnot. It's a really chill cheesecake, not much had to be done except making the chocolate chip cookie dough, because I definitely was not putting storebought cookie dough into this cheesecake. The cheesecake is really good! It's creamy and just the right taste, not too sweet. The crust is made of chocolate teddy grahams, which I think I'd change to regular vanilla/honey teddy grahams if I were to do this again. I feel like there was too much chocolate going on, especially since I used a whipped chocolate ganache to cover the cracks on top of the cheesecake. Still, seeminly excess chocolate aside, this cheesecake was really good. Lastly, I made apple/pear crisp. It came from the idea that I was going to make pear tarte tatin, but I had left the pears sit for too long and I couldn't use all 6 like I wanted to in the tarte, so I decided to do something else. This crisp is really simple and kind of rustic. It has apples and pears and a few cranberries. 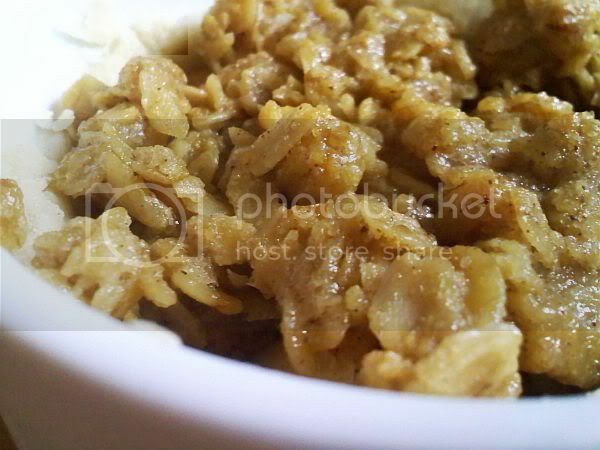 The crisp on top is simple, just oats and sugar and some flour. It's perfect for breakfast or for dessert with vanilla ice cream. This has become a favorite anytime dessert/snack at my house. It came from me having peaches on hand and wanting to make an upsidedown cake. I was tired of the old peach cobbler and needed something new. Don't get me wrong, I love love love peach cobbler, but sometimes it's good to try out new things. This cake is a kaffe kuchen from my mom's mother's cookbook, and we've been using the recipe for a really long time. 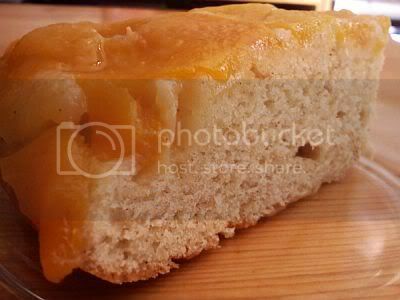 The cake is so fluffy and light, and the peaches are the perfect topping to it. It's summery and sweet and perfect for any time of day. I've made this cake about 4 or 5 times now, and I wanted to try to modify it a few days ago. I looked up a recipe for a caramel sauce, and I made it. The sauce was exactly like candy caramel, and I knew it wasn't what I was looking for, but I drizzled a little into the bowl with the peaches to test it anyway. It was really bad. The peaches were cool compared to the heat of the fresh caramel, and the sauce hardened and were little hard caramel drops in with the peaches. It was a processed taste with the freshness of the peaches, and it just wasn't working. I will not mess with the natural perfection of this cake anymore. 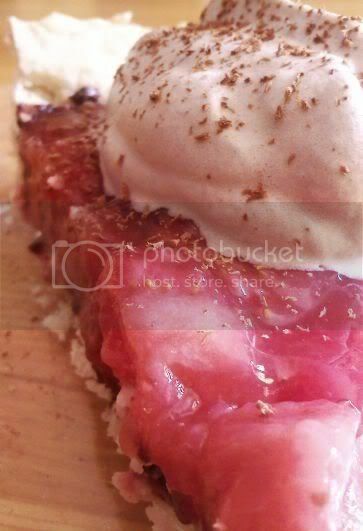 There aren't many strawberry desserts that I know of, or that I could find on the internet. The one that kept showing up was strawberry pie. So, I found the best one I could. I read the reviews and adjusted the recipe accordingly. I had such a difficult time with the pie crust. The dough just kept cracking and I had to piece it together into the pie plate. It was a hassle, but now that it's baked, it has a good texture. It holds its shape nicely, and isn't tough or chewy. It's just the way it should be! When it finished baking, I melted 2 ounces of bittersweet chocolate and painted the crust to give it a nice, but subtle, chocolate flavor. The strawberry filling was cornstarch, sugar, and fresh strawberries. It couldn't have been simpler! I'm so pleased with the results. Maybe if I had added a little lemon juice, it would have tasted a little fresher and had more of the strawberry tartness that is expected from raw strawberries. I'll try that next time. I put the pie in the freezer to set; I knew people would want to eat it the same day, so it needed to set quickly. It froze the strawberries a little too much, but it was really great. I'd rather it be a little frozen than totally jelly like and not set. To top the pie, I whipped some cream and added cocoa powder and sugar. It was the perfect accent to the strawberries and brought out the chocolate flavor from the chocolate painted crust. I love this pie! Kahlua cupcakes without chocolate icing. They looked so perfect, I couldn't not take a picture of them! This is the first time I've ever "invented" something to bake. I say "invented" because I'm sure that it's been thought of before, but I've never heard of it. So, I'm really proud of myself for doing this. I took a vanilla cupcake recipe, and I used a vanilla bean plus a little bit of vanilla extract, and I put about and eighth (or a little more...) of a cup of Kahlua in it. So, to the taste and texture. The flavors are "perfectly melded". I scraped about half of a vanilla bean into the batter along with about a teaspoon of vanilla extract, and it gave the cupcakes so much more flavor. The Kahlua and the vanilla are really great together. The chocolate icing is buttercream icing that has whipped egg whites to make it fluffy and light. It was a little rough to start because the egg whites and the butter didn't come together very well right away, but after I added the vanilla and a little bit of Kahlua, and the melted chocolate, everything became creamy and well combined. The icing doesn't have an overpowering chocolate flavor, so it's really a nice compliment to the cakes. It's really the best icing I've ever made. The cakes are tender and fluffy and wonderfully golden. I love them, and I'm so proud of myself, and I'm definitely going to be making them again. I know I always say that, but I've already made them twice, and I have no intent to stop. Kahlua cupcakes with chocolate buttercream icing. I've had bananas sitting around thet house for a while, now, and they were getting really ripe. If I hadn't baked anything with them today, I would have had to throw them away. And coincidentally, my dad sent me some banana recipes in my email the other day. So I made the banana cake with coconut cream frosting. Except, I didn't put coconut in the frosting because my sister doesn't like coconut. The cake wasn't hard to make. There were many different steps to making it, but it was easy to organize the steps and keep them under control. It was fun. 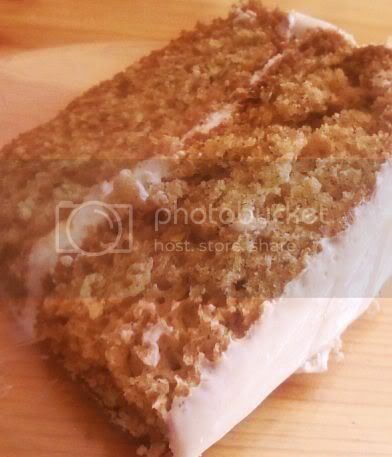 :) The cake is fluffy and moist, not too sweet, and the slight tang of the cream cheese icing is a good compliment. The cake has a subtle but definitely present banana flavor, which sets it apart from the usual banana bread. Okay, I have to say that I'm not perfect, in any sense of the word. What I hate more than anything is messing up a baking project, because it's my passion and I always put a lot of effort into what I do. A few nights ago, I attempted to make chocolate souffles. That was a bust. They were too dry and crumbly. I think I know what happened. The butter and chocolate started to separated and the final batter mix looked lumpy and weird. I knew they wouldn't be perfect once I saw that had happened, and maybe the recipe wasn't that great, either. Oh, well. I'll try again someday. Today, I made blueberry coffeecake. I didn't use a bundt pan like the recipe stipulated. I used a 9 inch cake pan instead. I think what went really wrong in this one was that I didn't use the pan that they used in the recipe, so I didn't have a solid cooking time. Also, the streusel topping I made was too buttery, and I needed to add more flour. Therefore, the topping melted all over the top of the cake and it doesn't look too great. But, I did have a piece, and the taste is great. The cake itself is really fluffy and nice, but it's not a pretty picture, so I won't be posting one. Note: The coffeecake wasn't actually a fail other than the failed streusel topping. The rest was so delicious, and the topping actually tasted really good. If I hadn't been so lazy and/or too busy enjoying this cake, I would have posted a picture, but now it's too late. Today is my mom's birthday.. But unfortunately, she's in the hospital with my sister, who is getting her gallbladder removed. I made muffins! I figured it'd be nice to come home to something sweet. The muffin recipe is one that my mom has had for a really long time, and I used to make them all the time. I used to have the recipe memorized! But that was a simpler time, a time in which I didn't make so many things, and I had time to make muffins almost everyday. 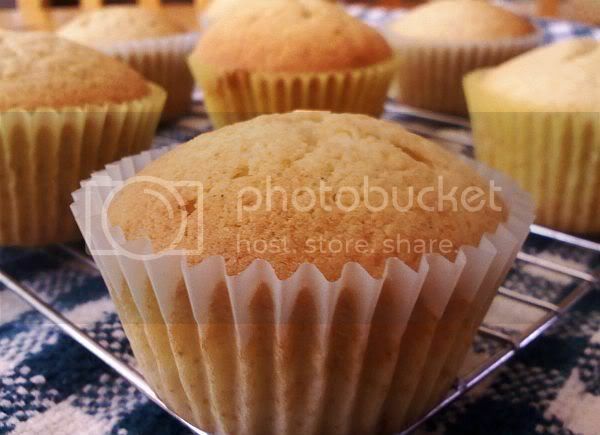 These muffins are always great, and can be made with any fruit. This is not only the first time in a while that I'm making scones, but it's also that I'm using a cookbook. I've been relying on the internet for a lot of my recipes. Cookbook recipes tend to be more reliable, but the ones on the internet have reviews and people who have tried and tested new things.. it's like a cheat sheet. :) The book that I used today is one that I've used a lot in the past- A Passion for Baking by Marcy Goldman. To be honest, I've posted these scones on here before, a long time ago, as just plain blueberry scones. The original recipe is for blackberry and blueberry scones. I didn't notice that, and since I just used up all my blackberries on the clafouti (which has disappeared now.. hmm..), I decided to use raspberries. Summertime is so nice because there are always such a variety of cheaply priced, great flavored berries to choose from. Baking in summer is a joy. :) The recipe is very easy to follow. 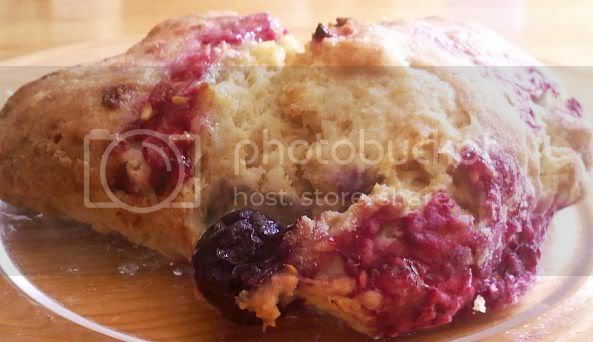 The only problem I had with these scones was that the raspberries got smushed so easily. It's frustrating to get it all over the floured counter and wonder if it'll work out well in the end. It did. :) The butter honey glaze on top is so great, it sinks in and makes the top soft in some places, while others stay a bit more crisp, and the middle is flaky and delicious. I love scones. Saturday at the farmer's market, my mom and I got these blackberries. I was psyched because they're one of the first fruits of the summer, but then I got to thinking, and I had nooo idea what to bake them into. So I googled blackberry recipes and I got this. 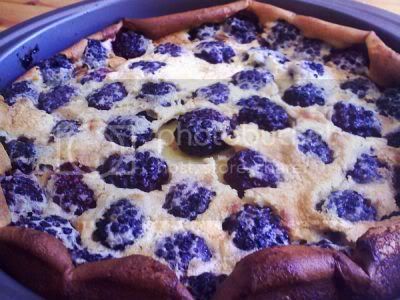 I've only ever heard the word clafouti a couple times, and I've never eaten it. Therefore, I was a little tentative at how this would turn out, but it was such a ridiculously simple recipe, and you can make it with any berry, and it looks professional. I'd post the recipe up here, but I can't find it on google anymore.. I'm glad I found it when I did, then.